Wickedfood Cooking School in Johannesburg recently hosted members of Next BioSciences to a fun evening of cooking and team building. The participants all got involved cooking a 3-course meal consisting of 6 different dishes. This team building activity was heaps of fun as participants all got to mingle in a private cooking studio in Johannesburg while participating together towards a common goal. The Spanish themed menu was a hit and everyone enjoyed their cooked food. Well done to all you cooks who cooked up a storm. 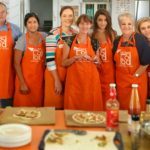 Wickedfood Cooking School in Sunninghill, also offers cooking classes to the general public at its purpose-built cooking school. These cooking classes are great for hobby cooks wanting to increase their kitchen knowledge. We schedule these cooking classes every Monday at 6pm. Seats are limited and booking is essential. These cooking classes are aimed at everyone wanting to be more confident in cooking certain cuisines or brushing up on a cooking skill.